The 81-year-old Forza Italia leader last held office himself in 2011, when he was forced out by an EU-directed coup for failing to co-operate with the bloc’s leading figures on the Eurozone crisis. His party formed a coalition with Matteo Salvini’s nationalist Lega party — formerly Lega Nord, or the Northern League — and the smaller Brothers of Italy party ahead of the Italian elections in early March, and came in first place, with Salvini’s outfit leading the pack. 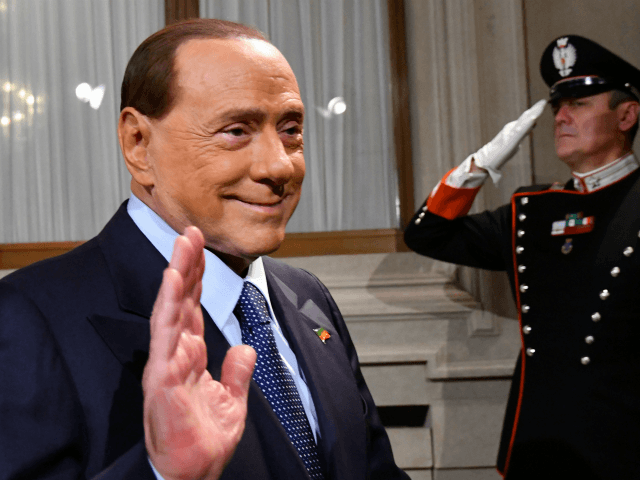 However, the alliance did not win a large enough share of the vote to form a majority government, and Berlusconi is seeking to establish whether a programme of government can be arranged with the anti-establishment M5S — now Italy’s single-largest party by far. The elder statesman thinks M5S and the right could agree a “pre-determined agenda to tackle issues such as the economy, labour, security and immigration,” Reuters reports. While M5S contains strong strands of left-liberalism, there is significant overlap between it and the centre-right on the EU and the single currency, where Lega is particularly sceptical, and mass migration — and both Salvini and M5S leader Luigi Di Maio have indicated they are open to an arrangement. Former White House chief strategist Steve Bannon, who was a key player in U.S. President Donald Trump’s successful election campaign, has expressed strong support for a compact between Lega and M5S, despite their differences, arguing that it would “pierce the heart” of the EU establishment. “Both the League and the Five-Star Movement (and Berlusconi himself) came out in favour of Trump,” he observed as Italian voters were heading to the polls. “I have respect for both movements, with their differences: one more secular, the other an expression of the more traditional society; one more anti-system, the other perhaps more with a clearer plan of action.